What are some games that are like PAL1? like the game graphics, storyline OR date of release that's similar to PAL? I think Softstar's "Xuan Yuan Jian" series and SoftWorld's "Jin Yong Qun Xia Zhuan" are also classic Chinese RPGs in the 1990s... but the three are mostly in totally different styles. There is also Kingsoft's "Jian Xia Qing Yuan" which tried to imitate PAL1, but with more curtural and historical backgrounds (IMHO it's less interesting but pretty good too). another game which worths to mention is Softstar's "Pi Li Qi Xia Zhuan", which is based on the story of a Taiwanese puppet drama. 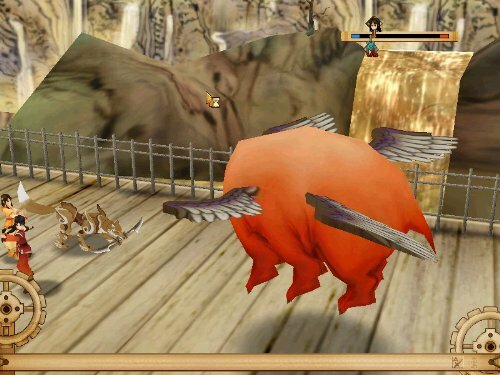 This game is made by the same team as NewPAL XP and many of the elements in this game (items, magics, etc.) were taken from PAL1. Woah that's an awesome screenshot, that's xy!! another really good Chinese Wu Xia RPG game also made by SoftStar is Xuan Yuan Jian, also translated as Sword of Xuan Yuan. SoftStar seems is publishing the Xian Jian game in the odd year and publishing the Sword of Xuan Yuan game the in the even year. 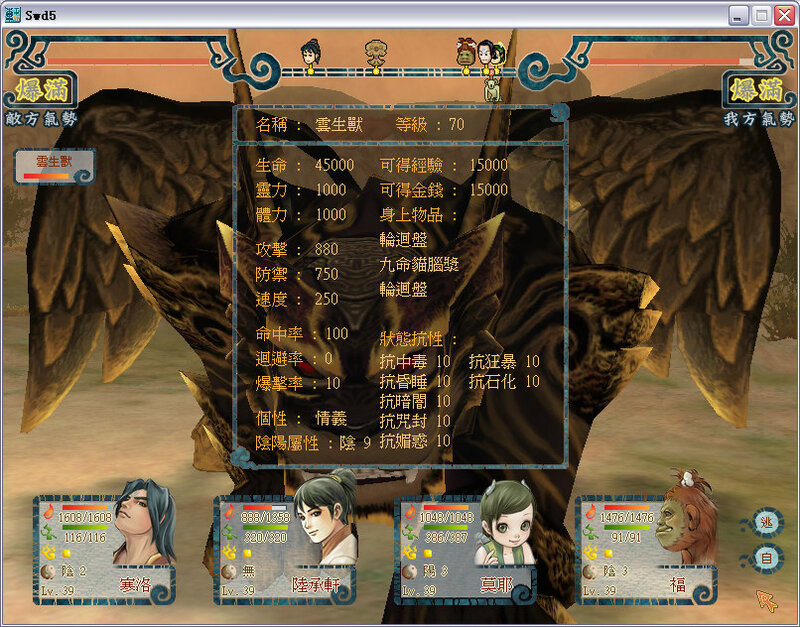 Sword of Xuan Yuan series already had 9 games including the newest one just came ou the end of 2007. The DOMO team who made Sword of Xuan Yuan game series became really famous in China. the Xian Jian series and Sword of Xuan Yuan Series are "2 Sharp Swords" of SoftStar to lead the Chinese RPG market. actually I thin the gameplay of Sword of Xuan Yuan series is much better than Xian Jian Series. Sword of Xuan Yuan has love too, but more focus on Chinese History, the interesting gameplay mixed Chinese History with old Chinese fairy tale about Gods and Devils. the name of Xian Jian series is always The Legend of Sword and Fairy plus the series version nuber, such as "The Legend of Sword and Fairy I"
they only have one expansion which is "The Legend of Sword and Fairy III: The Proposal"
the name of Sowrd of Xuan Yuan always as Sword of Xuan Yuan whith the version number and the version name, such as "Sword of Xuan Yuan III : Beyond Clouds and Mountains"
and the name of expansion are always as Sword of Xuan Yuan Legend, then the name of the expansion. for exanple: "Sword of Xuan Yuan Legend: Billows of the Bleak"
those are my summary above, if you guys are interesting in Sword of Xuan Yuan. they have more infor in WIKI which I pu the link below. and if you can read Chinese, read the Chinese WIKI about those 2 games. they have more infor because there are more fans in China. these are some snapshots about Sword of Xuan Yuan Series. and the link below are opening CG.